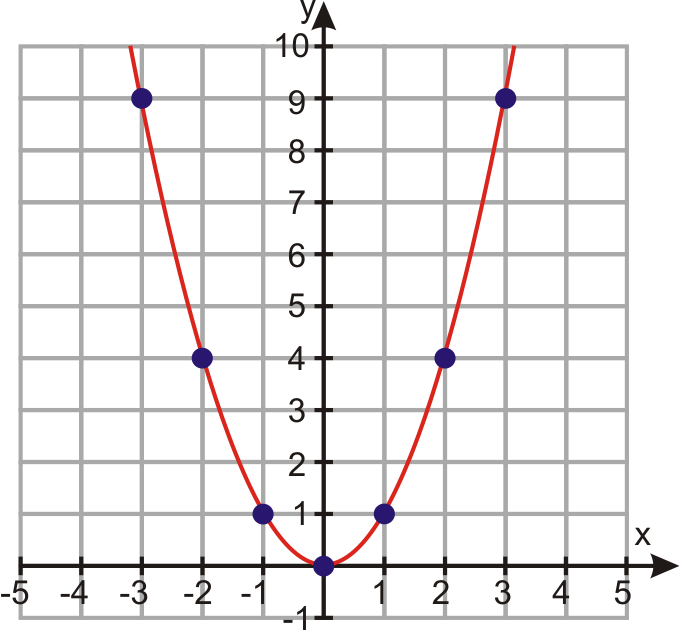 What Is a Quadratic Relationship? A quadratic relationship links to a quadratic formula, which are used to calculate the height of a kicked ball, or such. Quadratic relationships has 2 as its highest degree; y = ax² + bx +c would be a quadratic relationship's formula. Quadratic relationships can be put into a chart; the same as a linear relationship. In a quadratic relationship, the first differences are not constant, but the second differences are. In a linear relationship, the first differences will turn out to be constant. The differences are found by putting the x coordinates and the corresponding y coordinates into seperate columns. Then, the first differences column is added, along with the second differences column. The first box in the first differences column should be ignored, and the first two boxes of the second differences column should be ignored. There are three forms of quadratic equations: vertex form, x-intercept form and standard form. 'a' represents the stretch factor (if there is one). 'b' and 'h' represent the x coordinate of the parabola's vertex/the axis of symmetry. 'c' represents the parabola's y-intercept (if there is any). 'k' represents the y value of the vertex. 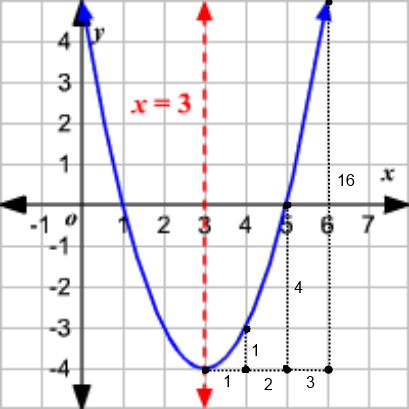 'r' and 's' represents the parabola's x-intercepts (if there are any). 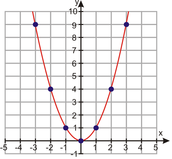 Quadratic graphs are made through a parabola. 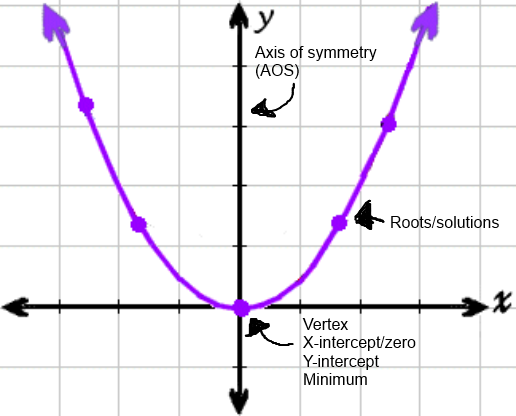 Parabolas can either have a maximum/minimum (y value). Parabolas are used to find the height of a kicked ball, an object that is thrown into the air, or etc. 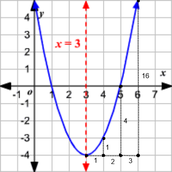 There are several types of transformations in a quadratic graph. Some of these transformations are: horizontal translation to the right/left by (#), vertical translation up/down (#), vertical flip, stretch by a factor of (#). A quadratic graph has 6 key parts. The step pattern works in a quadratic graph to find the next point if the stretch factor is given. The step pattern starts from the vertex of a parabola, and follows an "over 1, up/down 1, over 2, up/down 4, over 3 up/down 16" pattern. Up meaning that the stretch factor is positive and down meaning that the stretch factor is negative. A quadratic expression in factored form could be: (x+2)(x+2). Factoring quadratic expressions turns the expression into x-intercept form. Quadratic expressions has five types of factoring: common factoring, perfect squares factoring, difference of squares factoring, factoring simple trinomials, and factoring complex trinomials. Quadratic expressions could be expanded (simplified) by using the distributive property. Quadratic equations can be solved when the left side is equal to the right side of the equal sign. 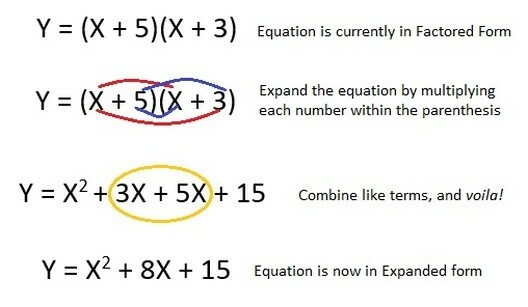 These equations can be solved when they are factored. Solving for quadratic equations means to find the variable's value. Solving a standard form (ax + bx + c) equations can easily be done by factoring it first, then seperating the brackets into two parts. The three parts of quadratics link through many different ways. Factoring links to solving equations, as does solving equations to graphing. Graphing and factoring link as there are different forms the graph's equation can be in. Factoring an equation of a parabola such as y = x² + 7x + 12 can be factored into y = (x + 3)(x + 4). Solving goes into graphing as it helps to find certain points on a graph (e.g. x-intercepts, vertex, etc.). To solve equations, it is important to be able to factor. Some equations involve factoring then solving; complex trinomials. A trinomial like 5x² + 12x + 4 = 0 can be factored into (5x + 2)(x + 2) = 0, which can then be solved as 5x + 2 = 0 and x + 2 = 0. Factoring comes in handy for solving equations and graphing. Factored forms can be used to solve equations as they can be used for graphing.